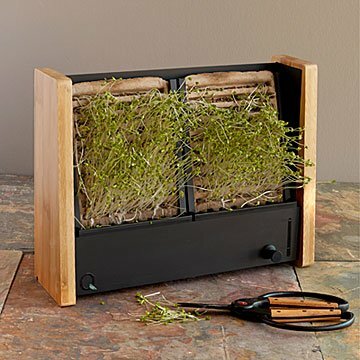 Growing highly nutritious microgreens is fast and easy, even in small spaces, with this vertical garden. Even if you've never tended a houseplant, let alone gardened, with Andrew Hung & Kevin Liang's simple, compact setup, you'll be eating mini veggies with maxi bennies in about ten days. Sprinkle the included broccoli seeds onto the pads—they'll fall right into the pockets designed for them. Put the pads in the frame, fill the frame base with water. Your job is done. Now it's the seeds' turn: Your little greens will grow, day by day, as they soak up exactly the water and nutrients they need. Even the tiniest, window-challenged apartment has room and light enough for this space-saving design that fits on a windowsill or hangs on a wall—the seeds will sprout even in artificial light. Comes with four compostable seed pads that you can plant two at a time. The broccoli refills include four seed pads each, plus seeds. Grow in whatever combinations you like, and use in salads, atop veggie burgers, or just munch as-is. Designed in California. Made in China. Self-described “aquarium geeks” who met in high school in San Diego, Kevin Liang and Andrew Hung love cooking and eating healthy, delicious foods. But their passion for food isn’t reserved only to the kitchen. They believe that the future of food production is sustainable agriculture, like hydroponics and aquaponics, which grow food 30-50% faster while using 90% less water than conventional, land-based methods. These systems are not subject to rain or drought. Humans control the environment, so the weather is perfect every single day. Clean reservoir and seed holder with damp cloth.